The Offshore Patrol Vessels market is booming. It is set to hold a 27% share over the next ten years in the global vessel market. While many countries cannot afford the guideline to put 2% of their GDP into NATO’s overall budget, the focus has been put on navies and coastguards around the world to respond to potential disputes, such as the growing influence of the Russian Navy in the Balkans or to assist during humanitarian crises. 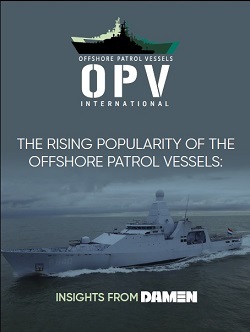 Read our exclusive interview on the industry’s insight into the overall OPV Market with Mr Piet Van Rooij, manager design and proposal at Damen Shipyard HQ in Gorinchem, Netherlands.